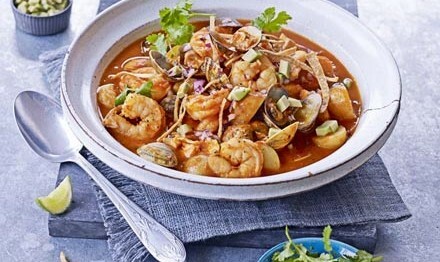 Mexican-inspired one-pot casserole is packed with shellfish, white fish and plenty of chilli. Toast the chillies in a hot dry frying pan for a few moments (they will puff up a bit), then remove. Deseed and stem chillies, and soak in boiling water for 15 mins. Heat the olive oil in a large saucepan over a medium heat. Add the onion and garlic, season and cook for about 5 mins or until softened. Add the chipotle paste, reconstituted chillies, cumin, stock and tomatoes. Sauté for 5 mins, then purée until very fine in a blender. Pour back into the pan and bring to the boil. Reduce the heat and simmer for 10 mins. When close to eating, add the prawns, fish fillets, clams and potatoes. Place a lid on top and cook for 5 mins over a medium-high heat. Add the lime juice and serve with lime wedges, avocado, coriander, red onion and tortilla chips for sprinkling over.